Introducing New table Linen Product Lines for 2019. Monarch Brands introduces a full line of spun poly table linen and bistro napkins packed for the commercial laundry market to complement our existing line of napery and aprons. Introducing Mariposa table linen, Monarch Brands’ inaugural table linen line! These spun poly table linens will not fade over time. We carry black and white tablecloths for tables of various sizes. Serving two-tops to ten-tops, they’re available in both square and rectangle sizes. These tablecloths pair with our spun poly napkin and apron lines. Soft to the touch, this premium quality yarn-dyed striped napkin is absorbent and offers great soil and stain release. 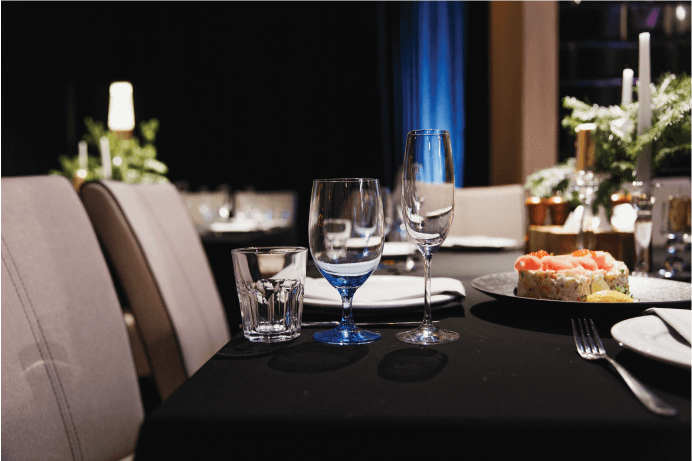 Our spun poly napkin bistro napkins will enhance the ambiance at your restaurant, cafe, hotel, or event a. The pre-cut 18” x 22” napkin with hemmed edges provides ample surface area for guests. With its many great features, this napkin will bring a pop-of-color to any place setting! A staple item for all restaurant laundries, we offer tough and economic poly aprons for chefs, waiters and baristas. Our route ready napkins are truck-to-table, eliminating the need to pre-wash and sort. New additions to the line include green and gold napkins. Ask us about custom colors for your restaurant, hotel or club.